Despite the growth of mobile banking, the bank branch has proven to be a pivotal part of the business, and technology such as interactive bank walls, digital displays and biometrics are transforming the banking experience – across regions. 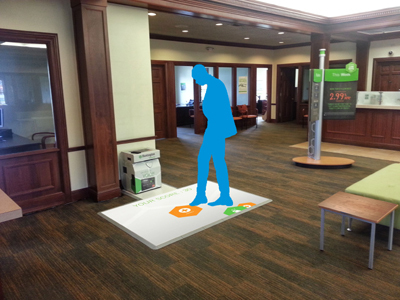 In North America, digital displays are being used to educate customers and assist banking professionals with guided conversations. In Europe banks are rethinking the “teller” model entirely as they move toward a digital banking experience. In Asia, branch patrons are identified by a camera using biometrics and greeted by name upon entering the branch. Though technology approaches may differ based on the region, across the world banking is becoming a more personalized experience. Digital displays are being used to educate customers and more deeply engage with banking professionals to make important financial decisions like buying a home or getting a student loan. This is not unique to North America; however, what is unique is how the engagement takes place. In North America, privacy concerns and cultural norms, to some extent, limit how comfortable individual patrons are with “big brother” knowing too much about them. Americans and Canadians desire a certain level of anonymity or subtly behind the engagement. As such, greeting a customer by name as they walk into the branch or pulling up an individual’s transaction history is seen as taboo. How North Americans use the branch is also changing. The branch has become a place to go to discuss bigger life decisions – what happens if I buy a house, can I access money for a student loan? With that function in mind, a patron would be surprised and uncomfortable to enter a branch without a significant human element. North Americans like working one-on-one with a person when it comes to dealing with these types of financial matters. After all, a 2012 Accenture study confirmed Canadians and Americans like dealing with people not machines when it comes to money. With the North American culture in mind, marketers can use these expectations and parameters to develop a comfortable experience fit for the region. Markets can create demographic profiles for their customers and deliver a message to that broader target demographic. If Card Services wants to drive up credit card applications, the digital signage program can work toward the objective of bringing up the baseline number of applications per month by creating an interactive experience that highlights, for example, the rewards available through a particular card. Alternatively, a digital campaign might seek to measurably improve brand awareness in a specific region or raise awareness of its work with local or regional organizations. Europe has historically been ahead of North America when it comes to the adoption of new banking technologies. In the credit card industry, Europe adopted newer chip and pin technologies far ahead of the North American market, that was too concerned about privacy and comfort with the magnetic strip to make the move to a more efficient technology too quickly. Now, in Europe banks are rethinking the need for the traditional “teller” and are moving toward a digital banking experience within the branch where there is only one banking representative and mobile tablet stations to conduct banking reinforced with digital displays. In addition to saving on bank personnel, this approach also yields cost savings from reduction of print collateral delivered via a completely digital experience. And unlike with print collateral, messages can be changed quickly, an unlimited of times to ensure the right message is always being broadcasted. The deep integration of digital technology also opens new doors for marketers to deliver a multi-channel banking experience. We’re now seeing huge mega-banks popping up in Asia and those banks are very different. Facial recognition, in any region, gives marketers the ability to capture the characteristics of customers (age, race, gender) with a camera that does an algorithmic analysis of their face to drive messaging that may be most relevant to that consumer. Banks can use facial recognition integrated with digital signage to profile and more accurately target their customers. In markets where privacy is less of a concern, like Asia, high net worth banks may use a camera facing the front door to identify patrons so they can greet them immediately by name. This is considered a societal honor by their social norms and enables a transparent, one-to-one digital interaction and personalized services specifically for that particular customer. According to a 2013 McKinsey study on retail banking in Asia, Retail banking in Asia: Actionable insights for new opportunities, Asia will reach over USD 900 billion in retail banking revenue by 2020 and is expected to be the second largest wealth management region globally after the United States, with more personal financial assets than Europe by 2015. Bank marketers will need to adapt their strategies and shape the banking experience based on these region-specific customer behaviors. Retail banks have a tremendous opportunity in front of them with what digital signage can help them to achieve. Marketers can influence customer behavior, loyalty, brand perception, and sales of bank products and services by better educating and engaging their customers. Global banks are now rethinking how they can use these techniques to revitalize their branches, engage millennial and remain competitive in the world of online and mobile banking. The ones who have already started down this path will be the first to benefit from the opportunity waiting to be seized.